BRISBANE Roar suffered rare back-to-back losses as Adelaide recorded a 3-0 win in their A-League pre-season trial at Clive Berghofer Stadium. 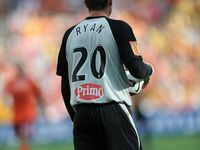 The Roar went down 2-0 to Melbourne Victory the previous weekend in their first loss in nearly 12 months before falling victim to an Adelaide side that looks capable of challenging for the A-League title this season. Roar coach Ange Postecoglou was upbeat after the match despite the loss, which was played in front of a crowd of about 2500 spectators. He put much of the result down to what the coach described as a sub-standard playing surface. The Roar built their premiership win last season on attractive football centred on playing the ball along the ground and the uneven surface frustrated the players and Roar boss. "I was quite pleased actually," he said after addressing his players on the ground after the loss. "We stuck to our game plan and the things we've been working on are coming together. "Obviously, the pitch didn't help us and it made it hard for the players but I was really happy with how they kept persisting, trying to play the way we want to play and what we're looking for is long-term results and I'm sure they'll come." The Roar looked anything but defending champions early in the first half when Adelaide was on top. This ascendancy was converted into an advantage on the scoreboard in the 11th minute through a fortunate goal from Reds midfielder Spase Dilevski after taking a deflection off Roar counterpart Massimo Murdocca. 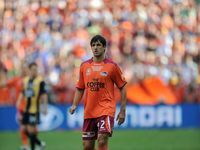 Brisbane looked a chance to equalise 10 minutes later when Luke Brattan was one-on-one with Reds keeper Eugene Galekovic, only for Dilevski to pull the Roar midfielder back on his run. 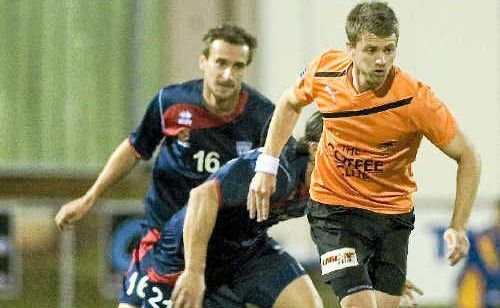 Dilevski picked up a yellow card and Thomas Broich's free kick was then off-target. Adelaide took a 1-0 advantage into half-time but striker Bruce Djite doubled that in the 48th minute after he managed to lose the Roar defence. Michele LaStella then capped the 3-0 win with a goal in the 69th minute. Postecoglou still took positives from the game. "We don't normally lose, I don't like losing to be honest. But I can't be critical of the players today," he said. "They stuck to it and hopefully, hopefully, people write us off."